The Aspen Clinic is celebrating its 30th year and continuing its mission to provide patients with the motivation and education they need to make simple lifestyle changes that will enhance their overall well-being and improve their quality of life. The main objective is to provide the best possible customer service and support system to clients in order to help them achieve their desired goal weight. 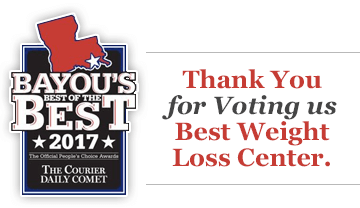 When the Aspen Clinic was founded in 1988, it started with one weight loss clinic in Baton Rouge and has grown to 9 clinics throughout South Louisiana. Now, with 50 employees and clinics in Baton Rouge, Prairieville, Lafayette, Harvey, Slidell, Hammond, Metairie, Houma, and Covington, the Aspen Clinic is well-equipped to help its patients lose weight – and ultimately change lifestyles. Aspen Clinic is a local company, staffed by local people, who know and understand the lifestyle of Louisiana. Future plans for the Aspen Clinic include additional weight loss and health clinics and added services, such as skin care, accessories, therapeutic services, and more.